Funeral songs can express our feelings for our loved ones, and they can also express our deepest sadness. Whether it’s a funeral, a memorial service, or a celebration of life, a proper funeral song is very important. So here’s a list of some of the best funeral songs. And for those of you who don’t know how to download funeral songs, here’s how to record funeral songs online. The above is the good memorial songs for Mom or Christian, if we want to record these best funeral songs for Mom to our Mac, what we can do? Here we recommend a good recorder software to you, that is Leawo Music Recorder for Mac, it is a powerful software to record music from any source and retain 100% original quality of the sound. As a professional Mac music recording software program, it contributes a lot to record the audio from multiple sources such as YouTube, Spotify, Pandora, Apple Music, Google Play Music, Yahoo Music, Deezer, etc. 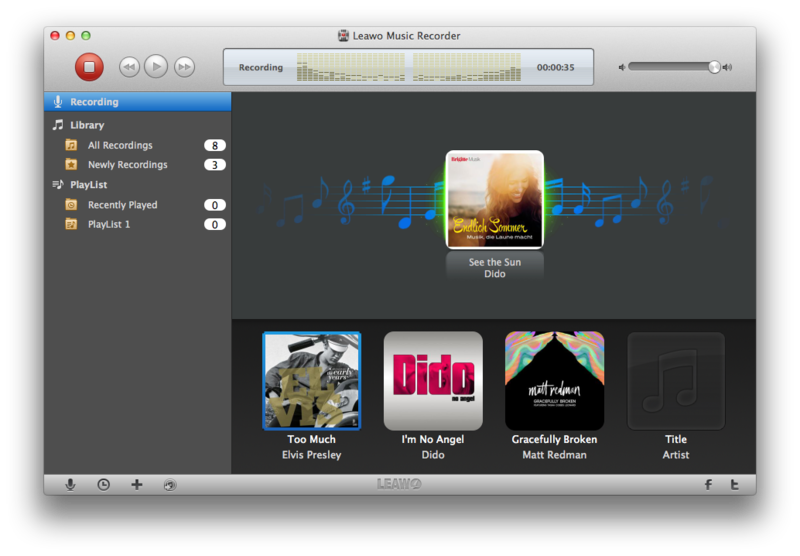 Which enables you to get any music free on Mac. The audio files from built-in audio and computer audio can be recorded to MP3, WAV and W4V audio files, the output audio Bit Rate and Sample Rate can be adjustable to your needs. Because of the smart feature of this music recorder, it not only helps you to record the music on Mac, but also it is easy for you to keep the recorded audio files well-managed on Mac by using internal library. 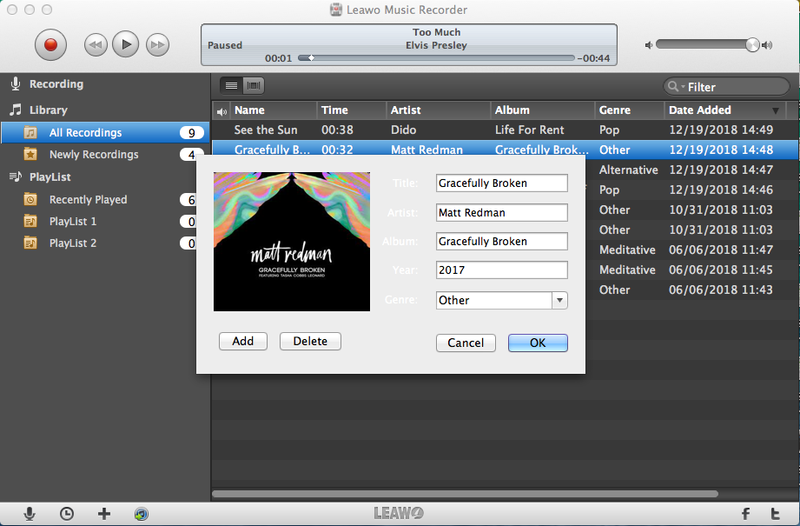 You can edit playlist according to your requirements with Leawo Music Recorder for Mac, no matter what you have recorded in the library, it is available for preset playlist added and new custom playlist. The playlist can also be modified when you add, delete or rename the songs. Only one-button operation can make the recorded music files to be added to iTunes music library. 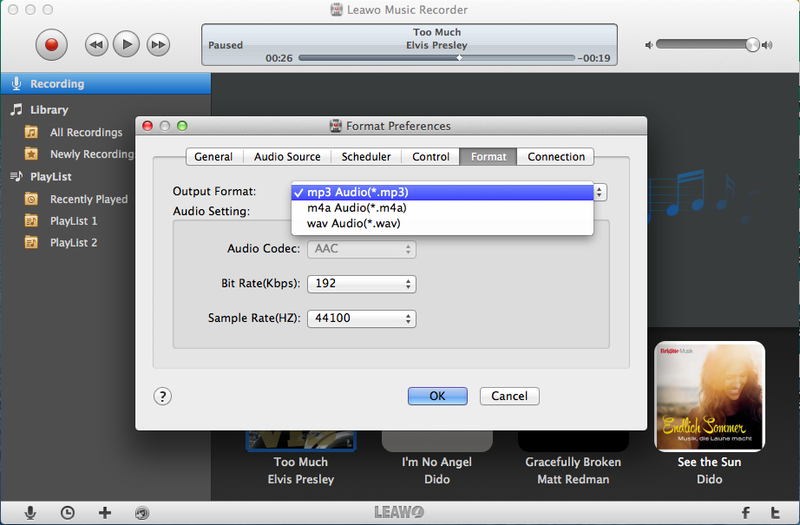 It is very convenient for you to enjoy the recorded music files on Mac at any possible moment. Due to its support for powerful online music database, music tags such as artist, album, song name, genre, etc. can be downloaded and added to recorded music files by Leawo music recorder. Additionally, a music editor inside is also provided by this music recorder for you to modify and edit music tags manually. Leawo music recorder is supported by powerful and innovative technology, a variety of basic settings such as Task Scheduler, Audio Source and Output format are provided to make your music customized as you need. It does a good favour to record the multiple music files in original quality and the settings can be customized as per your requirements. Leawo music recorder comes with lots of advantages, its auto track filter can help to get rid of advertisement, a time gap can be preset to record in order that it can skip the short recording to avoid the ads. Time intervals can be set to split what you record into two parts to prevent the mix from recording, this is auto track splitter function for this music recorder for Mac; Any sound can be recorded on Mac by Leawo music recorder, the recorded audio files can be saved in to WAV, MP3 or W4A format for different purposes; Audio codec, bit rate and sample rate can be adjusted by the internal audio parameter adjuster so that you can obtain a good quality recording in accordance with your needs. There are many significant features that make you enjoy using this music recorder with convenience. The dynamic recording process can be displayed on your Mac to enable you to see the recording progress directly. The program window of this music recorder can be minimized to make convenience for you to gain more space for recording music. If we want to record funeral songs online to our Mac computer, what we can do? There are some details as below teaching you how to record your favorite funeral songs online to your Mac. 1. 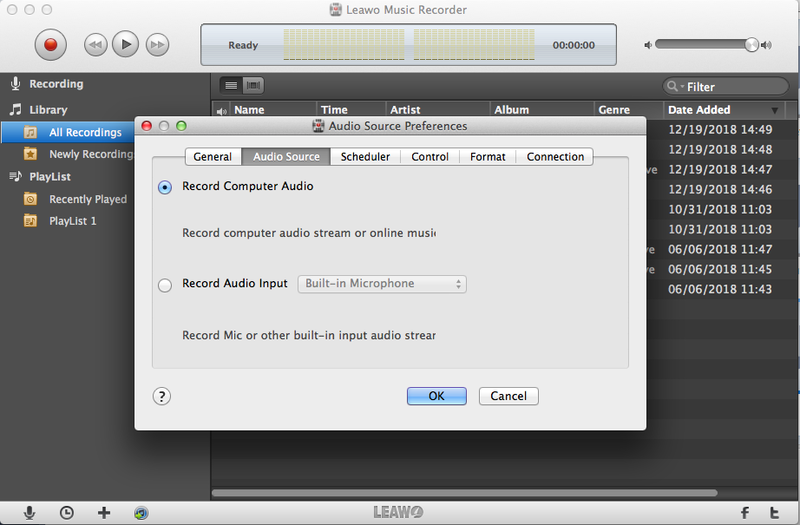 Before record the funeral songs on Mac, you must install Leawo Music Recorder for Mac to your Mac computer, run it and click “Audio Source” on the main interface and choose the audio source in which kind that you will record, you must select the source according to its real access. 2. You should save the audio recording format to your needs, the prompt of preferences will pop up to help you finish saving act followed by “Leawo Music Recorder – Preferences – Format". The output audio format and parameter setting can be done in this preferences window. 3. Go back to the main interface and click the red button “Start” to initiate recording. It is suggested to click the red button prior to playing source audio. 4. The music tags covering artist, song name, album artwork, album, etc. would be downloaded and added to recordings automatically by Leawo Music Recorder. In the case that the recorded music files are failed to be recognized by the program, you can go to "Library-All Recordings” to select the recording you need to edit by right-click and then you can edit music tags manually by choosing “Edit Music Tags” to bring out a small window of Music Tags Edit.